Quilting Adventures: Secret Santa Christmas Swap ....! 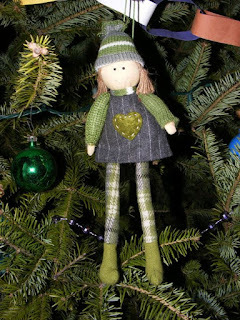 Every year Donna from Chookyblue Blog Spot organized a swap known as SSCS and ... I haven't missed one yet! When my parcel arrived from Australia, I was all excited to see what my ornament would be. This is what I received from Lurline. She makes a cute addition to my growing collection for ornaments from Blog Land! Thank you again Lurline for the ornament! I love it! Super cute from lovely Lurline. Happy Christmas! That is the cutest little ornament! I must have the pattern! Wonder if it is Australian? Do you know? What a nice swap!